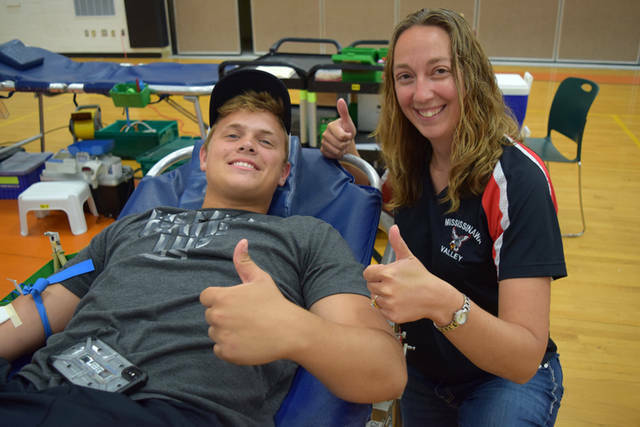 Mississinawa Valley High School FFA member Elijah Livingston and Mississinawa Valley FFA advisor Gwen Bergman are pictured at the ninth annual FFA Grudge Match Blood Drive in Ansonia. Mississinawa Valley High School FFA co-advisor Carmen Hartzell is pictured with her daughter Kate at the ninth annual FFA Grudge Match Blood Drive in Ansonia. FFA Presidents Will Hall of Mississinawa Valley and Ethan Fischer of Ansonia hold the trophy following their ninth annual FFA Grudge Match Blood Drive. 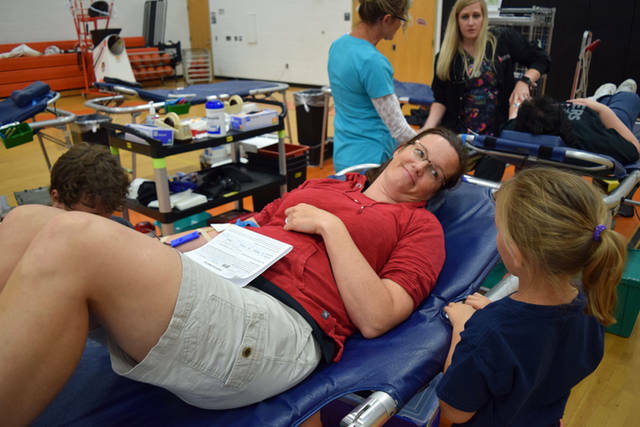 ANSONIA – The ninth annual FFA Grudge Match Blood Drive between rivals Mississinawa Valley and Ansonia high schools on Thursday was a tighter tug-of-war than anyone expected. The home team usually wins the annual Grudge Match. The MVHS FFA kept that record intact by claiming last summer’s Grudge Match in Union City. But this year the MVHS faithful also traveled in strong numbers to the Ansonia High gym and forced a surprising 15-15 stalemate. A tie qualifies as an upset in the history of this rivalry, but once again the true winner is Community Blood Center and the summer blood supply as the Fourth of July holiday approaches. The rivals topped 127 percent of their collection goal with 34 donors, including five first-time donors and 28 donations. MVHS FFA co-advisors Gwen Bergman and Carmen Hartzell were confident their club could compete, especially on a rainy first day of summer. Students are usually busy with outdoor jobs during the summer months, but the wet weather gave some a break to attend the blood drive. Bergman was quick to recruit senior FFA member Elijah Livingston when he arrived for his volunteer duties in the Donor Café. His vote proved valuable. Ansonia FFA co-advisor Zane Fessler voted for his club with his 11th lifetime donation but lamented the change of fortunes when comparing their December FFA blood drive, held on the second day of winter, to Thursday’s Grudge Match on the first day of summer. The Dec. 22 blood drive totaled 44 donors and reached 138 percent of goal. “If we could have kept up that momentum we’d being doing good,” Fessler said. 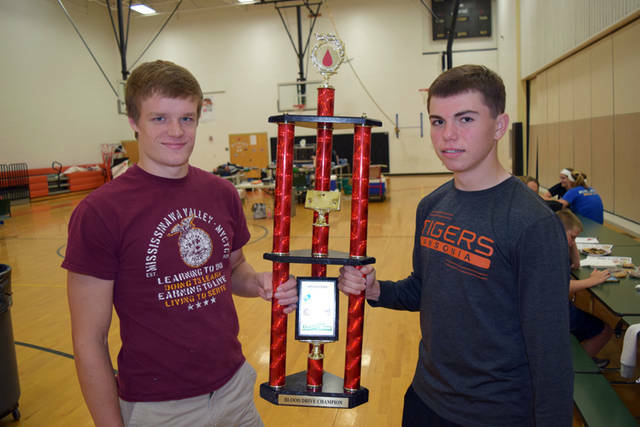 Rival FFA Presidents Will Hall from Mississinawa and Ethan Fischer held the Grudge Match Blood Drive trophy together. They schools will have to share ownership of the traveling trophy until next year. Fischer already is thinking about his term as president, and the next Christmas season blood drive. Connect with Community Blood Center for the latest information and services atwww.GivingBlood.org. Get fast and complete answers on how to make a first donation, organize a blood drive or bring Community Blood Center’s education program to a school. Get all the updates in the CBC/CTS newsroom, find quick links to Community Blood Center’s social media pages or schedule an appointment to donate by connecting to www.DonorTime.com. Donors are required to provide a photo ID that includes their full name. Past CBC donors also are asked to bring their CBC donor ID card. Donors must be at least 17 years of age (16 years old with parental consent: form available atwww.givingblood.org or at CBC branch and blood drive locations), weigh a minimum of 110 pounds (donors may have to weigh more, depending on their height) and be in good physical health. The Food and Drug Administration changes blood donor eligibility guidelines periodically. Individuals with eligibility questions are invited to email canidonate@cbccts.org or call 1(800)388-GIVE. Make an appointment at www.DonorTime.com. Community Blood Center/Community Tissue Services is an independent, not-for-profit organization. Community Blood Center provides blood products to 25 hospitals and health centers within a 15-county service area in the Miami (Ohio) and Whitewater (Indiana) Valleys. For more information about Community Blood Center/Community Tissue Services, visitwww.givingblood.org.